TWENTY thousand people marched through Wellington to New Zealand’s parliament on Wednesday May 5. 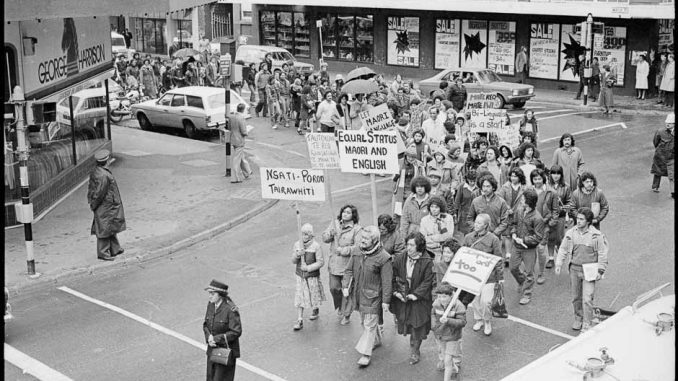 The march was the culmination of a historic “hikoi” (march) to protest government legislation that attacks Maori rights over New Zealand’s coastline. During the hikoi’s journey from the top and bottom of Aotearoa (New Zealand), tens of thousands of people took part, making it one of the biggest protests in this country in recent times. Even more significant was that 90 per cent of the protesters were Maori, Aotearoa’s indigenous people. Like Australia’s indigenous population, they still suffer the ill-effects of colonisation and racism. Maori make up 15 per cent of Aotearoa’s population, and have generally been more successful in fighting for their rights than Aborigines. The focus of the hikoi protest was a new law that denies Maori the chance to claim ownership of parts of the seabed and foreshore. The foreshore is usefully described as that part of the beach that gets wet, that is between the high and low-tide marks. Over the last few years, a series of court cases revealed that there were no legal titles to large parts of the foreshore or any of the seabed. The court of appeal ruled that “native title” had not been extinguished, so Maori tribes could take cases to establish their ownership. In response, the Labour government drew up a plan to stop Maori claims and declare government ownership. Maori overwhelmingly rejected these plans, but Labour pushed ahead. The current Labour government was elected in 1999 promising to “close the gaps” between Maori and Pakeha (whites), and between rich and poor. This promise helped Labour win back the seats in parliament that are set aside for Maori. But the slogan was dropped, and the gaps have continued to grow. Since then, working class people, both Maori and non-Maori, have grown frustrated with Labour’s pro-business policies. In February, the conservative Nationals’ new leader Don Brash gave discontented Pakeha a focus-blame Maori. Brash said that government policies that tried to recognise Maori cultural values were causing a “dangerous drift towards racial separatism” and giving Maori “special privileges”. His call for “equality” struck a chord and the Nationals overtook Labour in the polls for the first time in years. Meanwhile, Maori discontent found a focus around the issue of the foreshore and seabed. By ignoring Maori concerns over this issue, Labour has shown that their talk of partnership with Maori is empty rhetoric. Two of Labour’s Maori MPs have voted against the legislation. One has resigned from the party and will join a new Maori Party. The Maori Party is growing out of a real mass movement, which represents a decisive break with the corporate dominated politics of National and Labour. But will the new party work to maintain and strengthen this mass movement, or will it try and get its way by doing deals in parliament? And what can a Maori Party offer dissatisfied Pakeha? Because if the Nationals’ divide and rule racism gains a strong foothold among Pakeha disillusioned with Labour, then it will be a disaster not only for Maori, but for all working class people. The answers to these questions are far from clear. But I hope that the new Maori party can be part of building a radical alternative that embraces all the disenfranchised.